I had the pleasure of photographing little Ella’s parents’ maternity session just a month before she arrived. When I met her momma during their pre-session consultation she showed me the adorable nursery they were assembling for her. I knew that instant that this had to be a session done in shades of purple and grey. Being an traveling newborn photographer means I show up at your door step with everything I need for our session. During our pre-session consult we’ll discuss color and style and how you envision using the images around your home. The prior to the session I pull a selection of props from my ever growing array and bring it with me in large totes ( I totally look like I’m moving in!). For Miss Ella I pulled a variety of purple shades and textures and complemented it with some grey and ivory headbands and hats. I often will bring a basket or two with me as well for some variety. Little Miss was a dream to work with. She slept like a rock and let me do pretty much as I pleased. In all of my sessions I try to include some mom and dad pics too. The snuggles on the bed are some of my favorites. I know that most mom’s don’t feel all the glamorous after having a baby but the photos are so special that they’re hard to leave off. I tell the momma not to stress. Find something comfortable that you’re happy in. We’re focused more on you guys as a family than and that’s always beautiful! Lastly, I always bring my fuzzy rugs with me. I have them in so many colors now! I love the texture and the fun that the fuzzy brings. I love that you can layer it up with other textures and colors and it always looks great!! 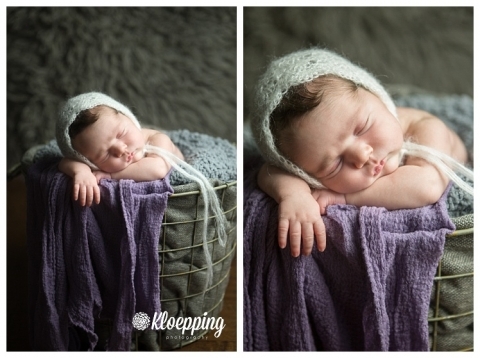 Being a newborn photographer in Northern Virginia is so much fun. I get to meet some of the most wonderful families and babies! I’m so looking forward to our 1 year cake smash with this girl!! If you’re interested in booking a newborn session with me click here for my request form! !